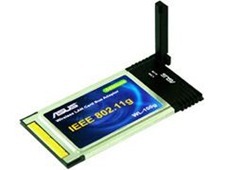 The WL-100G cardbus adaptor incorporates the OFDM modulation design to boost the IEEE802.11b's 11Mbps to 54Mbps of the IEEE802.11g WLAN standard. The all-new ASUS cardbus throws in advanced features and utilities for easy WLAN management and ultimate networking security. 1. Please run Setup.exe before plugging into the WLAN card. 2. The Vista driver does not support Afterburner function. Download 1, Download 2, 2.26 (MBytes), 2007/04/06 update.